This limited edition smartwatch is available with leather strap for $699 USD or with a gold plated stainless steel band, for $799 USD. Huawei unveiled its first Android Wear smartwatch earlier this year, but it had to face a few delays due to various software issues and some additional design refinements. Fortunately, it finally managed to hit the market in September, and now it also gets a gold plated limited edition. According to Huawei Fans Club Blog, Huawei Watch has just become "the world's first Android Wear watch with sapphire crystal and real gold." Rose Gold Huawei Watch has a 22K rose gold plated stainless steel case that features a coin-edge top ring, and two strap choices. The basic hardware and software remain the same - Qualcomm Snapdragon 400 SoC with 512 MB RAM and 4 GB internal storage, 1.4-inch full circle AMOLED 400X400 pixel display, Bluetooth 4.1 and WiFi connectivity, up to 2 days of autonomy. While the regular versions start at $349.99 USD, this limited edition goes all the way up to $799 USD. 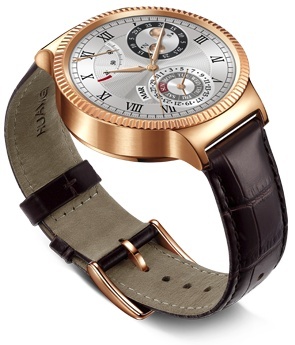 The Rose Gold edition with brown leather strap can be already purchased for $699 USD while the $799 USD variant with rose gold plated stainless steel link band should become available soon.